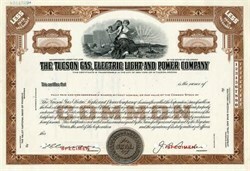 Beautifully engraved SPECIMEN certificate from the Tucson Gas & Electric Company. This historic document was printed by the Security Banknote Company and has an ornate border around it with a vignette of an allegorical woman with a torch. This item has the printed signatures of the Company’s President ( J. Luther Davis ) and Secretary. Electric power came to Tucson in the 1880s, but it wasn't until 1892 that a handful of business and community leaders formed a company that grew into the enterprise of today known as Tucson Electric Power, the principal subsidiary of UniSource Energy Corportion. Tucson had a population of less than 7,000 in 1892. A century later, the population of Pima County exceeded 800,000 people, most of whom live in metropolitan Tucson. The first generating equipment was housed in a one-story building on North Church Street, across from the present Pima County Courthouse. Today, Tucson Electric distributes power from five modern plants in Tucson, east-central and northern Arizona and in northwestern New Mexico. J. Luther Davis was named president in February 1959 and was elected a director in 1961. Upon his shoulders fell the task of preparing the company's first request for a general rate increase. In 1961, the company asked the ACC for permission to increase electric and gas rates by about 12 percent. After hearings that took only three days, the commission approved new rates raising electric revenues about 10.5 percent and gas revenues about 9 percent. In 1964, the company ended its status as a "foreign corporation" in Arizona, changing the name and domicile from Tucson Gas, Electric Light and Power Company, a Colorado corporation, to Tucson Gas & Electric Company (TG&E), an Arizona corporation. Information is from the company's press releases.